Rural Arnold, on the Broadneck Peninsula, was pretty much a little piece of Heaven isolated from the rest of the world. Most of the residents were farmers, and were basically self-sufficient. The small population, physical isolation, and common agricultural background gave the community its unique culture – that of respect for their fellow man, neighbor helping neighbor, and a social life which revolved largely around their church. The happenings in the “outside world” most likely had no effect on the community life of Arnold. James Knox Polk was beginning his term as eleventh President of the United States; Samuel Morse had put aside his artist brushes to whip in shape the great telegraph system; the Naval Academy was about to come into being. We know of no one who left home for the riches of the California gold rush or the excitement of the Mexican War. A poet from Baltimore had just published Annabelle Lee,” but most of the reading of Arnold folk was from the Bible. 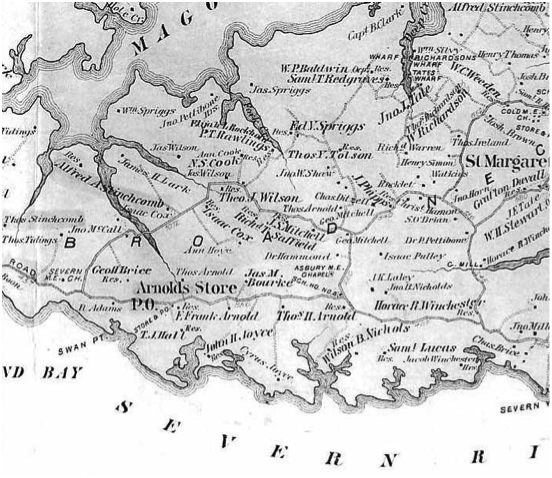 The main roads were Baltimore and Annapolis Boulevard following the length of the peninsula, and Old Jones Station Road crossing the peninsula. These roads were muddy tracks reinforced by oyster shells and cinders, and probably followed old Indian trails. Some few people had horse-drawn carriages or wagons, but the roads were in such poor condition that everybody traveled by horse. Even the children had their own horse. A large block or platform was in every yard for riders who needed aid in mounting. Every stable had an extra stall for guests. Crops of garden vegetables, peaches, cantaloupes, and water melons were sent to market in Baltimore and Annapolis by boat, and most supplies came in by boat. Wagons were loaded, driven out in water to the horses stomachs. The row boats came up between the wagons, and loading went on from each wagon at the same time. (photo of Stinchcomb wagons off-loading to boat)While the drivers returned to the field for more, the row boats rowed out to the “pungy1.” About 1200 baskets of peaches a day were sent to Baltimore from the Stinchcomb farm, at a price of about 17 cents a basket. The farms in these times supplied the needs of the family. Corn was a staple – shelled at home, sacks loaded onto the back of a horse and taken to the grist mill at Waterford Pond. Corn pone, cakes, mush, dumplings, hoe cakes, and ash cakes made good eating. Cooking was done by the open fireplace. Baking of bread, meal, pies, and cakes was made possible in cast iron pans (on legs) with flat iron lids. The hot coals under the pan and a shovel full of coals on the lid, presided over by an experienced cook, did the job. Johnny cakes were patted on thin boards and set in front of the fire. Meat was roasted on a spit in the fireplace. The coals in the fireplace were carefully preserved by putting a huge back log in for the night. In the unlikely event the coals went out, children were sent to the next farm with a bucket to bring back some live coals. One of the children’s chores was to make light pencil-like rolls of paper for use in lighting candles or oil lamps from the fireplace. Vegetables were home grown. Herbs were grown, harvested, and then dried, hanging from rafters in the attic. Brews were made from the herbs to “cure” many ills. Meat was raised on the farm, smoked or packed in salt to cure, and kept from season to season. The only fresh meat was in the winter, when some farm animals were butchered, or when a hunter got lucky, or supplied from the resident flock of chickens. Of course fish, crabs, clams and oysters were available for the taking. We are fortunate to have a hand-written manuscript written by Masonetta Mae Stinchcomb Waring, (b. 1880 d. 1965) the daughter of Alfred Asbury Stinchcomb and his wife, Sarah. Masonetta describes the life of a typical Arnold resident. Among the residents of Arnold, Alfred Asbury Stinchcomb was a leader in the community. Alfred inherited his farm and home, originally called Pettibone’s Rest, on Bayhead Road, from his father. The house exists today known as Bayhead. The homes were unpretentious, usually wooden frame construction, with room for large families. The typical Arnold farmhouse had a center hall, with stairs to the upper floor, a parlor on one side, family sitting room or dining room on the other side, and kitchen; with bedrooms upstairs – no indoor plumbing yet. Most houses had a long front porch running the length of the house. Carpets were made of rag strips, braided, and sewn together. Every tiny girl collected rag strips, rolled them into a ball. The balls were weighed and taken (by boat) to an establishment in Baltimore, and for 25 cents a yard, made into carpet. Of course the pattern was hit or miss, but seemed to blend with anything. Many homes had photographs of family members, framed with an oval frame enclosing a domed glass. In the winter, when there was no outdoor work to do, the ladies got together for quilting bees. Many hands were employed as the ladies sat around the quilt, rolled on a large frame – sometimes suspended on the backs of chairs, or sometimes rigged so that it could be pulled up to the ceiling when not in use. Mr. Stinchcomb built an ice house in which to preserve some foods and to have ice through the summer for himself and his neighbors. It was a huge circular pit lined with brick, with a low wall with a small door for access and covered with a roof. It was filled from a pond, now extinct, near the Bay. When the water froze in the winter, gathering blocks of ice for the ice house was a neighborhood event. Thus there was some manner of primitive refrigeration in Arnold, and home-made ice cream could be made in the summer. One of the loveliest weddings ever solemnized at Asbury M.E. Church, took place Thursday evening at 8:30 o’clock, uniting in the bonds of holy matrimony Miss Eliza Waring, daughter of Mr. Richard Waring, and Mr. Walter Stinchcomb, son of Mr. A.A. Stinchcomb, a prosperous farmer and vessel owner of Anne Arundel County. The church presented a beautiful scene for the nuptials. Three huge arches of evergreens were erected over and in front of the pulpit, while the walls were gaily festooned and banks of floral designs graced the chancel.To the strains of the wedding choral from Lohengrin, played upon the organ by Miss Masonetta Stinchcomb, sister of the groom, the bridal party entered the sacred edifice, the bridegroom attended by the bride’s youngest brother, Mr. Everett Waring, as best man, entering the church and advancing to meet the bride, who entered with her sister, Miss Nellie Waring, as maid of honor, preceded by their little sister, Lillian, as flower girl. The bride looked the ideal picture she represented. She wore a becoming gown of white silk, with full skirt, en train, high bodice, trimmed in orange blossoms. Her long tulle veil was confined to her soft dark hair, with a spray of orange blossoms. She carried an immense bouquet of Marachal Neil roses, tied with white satin ribbon. The maid of honor and flower girl were tastily costumed in pink and white organdy, with satin trimmings, bearing white roses. The ushers were Messrs. Harry R. and T. Theodore Waring, of Washington; Weems Winchester and Samuel T. Revell, of St. John’s College, and Roy V. Tydings and Carroll Brice, of St. Margaret’s. They wore the conventional dress suit with boutonnieres of roses. The bridegroom and the best man wore the same. Following the ceremony, a wedding lunch was given at the home of the groom, at which only the immediate relatives, a few intimate friends of the bride and groom and the bridal party were present. The young couple will reside on Magothy River, near Arnold. The Tydings house on a neighboring farm burned to the ground, so Alfred and Sarah took in the family. The hired hands were housed in out buildings until the new house could be built. The Tydings shared the work and the food bill. Mrs. Tydings was unable to help for long, she was expecting an addition to a then large family. In due time, the stork arrived. Alfred went for the doctor, and Sarah held the fort in a feeble way until the doctor arrived. Twins were born. Alfred made a cradle out of a wooden soap box. The twins’ mouths could not hold the average bottle set ups so quills were wrapped in old linen, stuck in a cork, then in a bottle. Those self-sufficient Arnold residents were great at improvising. The pungy is a type of schooner peculiar to the Chesapeake Bay; a two-masted gaff-rigged schooner. The deck is flush with a log rail, especially made to haul freight, particularly perishables. The story of life after the railroad came through Arnold going to Annapolis.